Merk Insights - Monetary Cliff? As the presidential election is rapidly approaching, little attention seems to be getting paid to the question that may affect voters the most: what will happen to the “easy money” policy? Federal Reserve (Fed) Chairman Bernanke’s current term will expire in January 2014 and Republican candidate Mitt Romney has vowed that if elected, he would replace Bernanke. Given the tremendous amount of money the Fed has “printed” and the commitment to keep interest rates low until mid-2015, the election may impact everything from mortgage costs to the cost of financing the U.S. debt. Trillions are at stake, as well as the fate of the U.S. dollar. Should Obama be re-elected, Bernanke might continue to serve as Fed Chairman; other likely candidates include the Fed’s Vice Chairman Janet Yellen and Obama’s former economic advisor Christina Romer. With any of them, we expect the Fed policy to be continuingly dominated by the dovish camp, and moving – with varying enthusiasm depending on the pick of Fed Chair – towards a formal employment target, further diluting any inflation target. 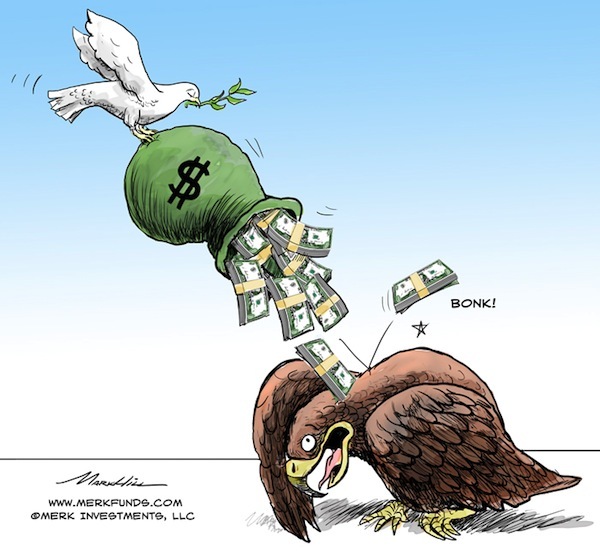 We are not only talking about Bernanke and the other two candidates’ individual policy stances (though all three are known as monetary “doves”, i.e. 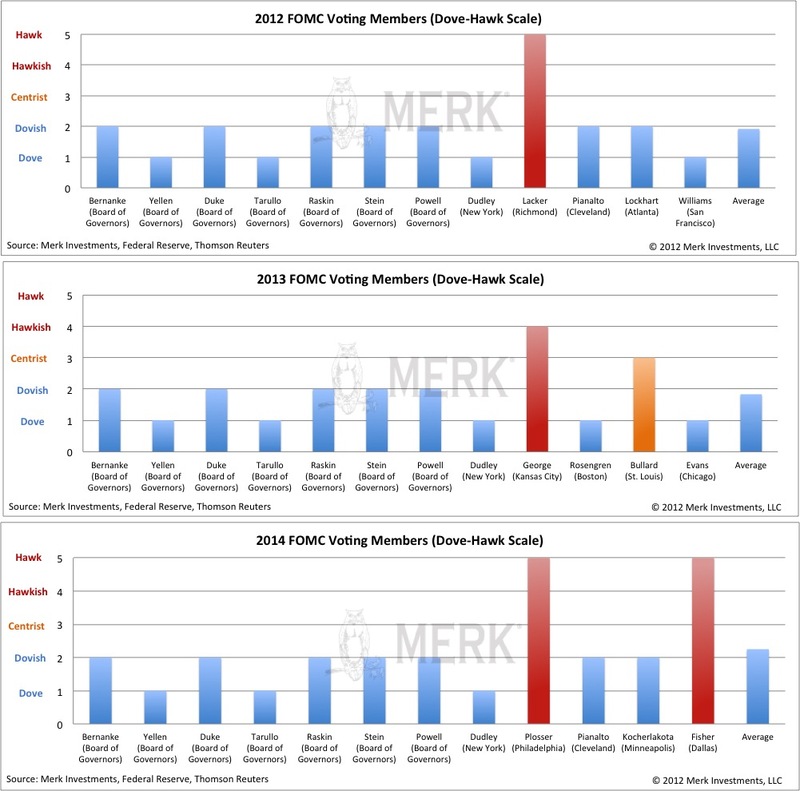 generally favoring more accommodative monetary policy), but also the composition of voting members of the Federal Open Market Committee (FOMC), as we will discuss below. If Romney were to be elected, a front-runner for the Fed Chairman post is Glenn Hubbard, Dean of Columbia Business School and a top economic adviser to Romney. Hubbard has expressed his skepticism about the mechanism that Bernanke used to boost the economy. In our analysis, an FOMC led by Hubbard (or another Romney appointee) will be leaning toward mopping up the liquidity sooner. Extending forward guidance to mid-2015 will also be under question. It will no doubt add uncertainty to monetary policy and increase market volatility. More importantly, however, a “hawkish” Fed Chair, i.e. one that favors monetary tightening, might put to the test Bernanke’s claim that he can raise rates in “15 minutes”. Technically, of course, the Fed can raise rates by paying interest on reserves held at the Fed or sell assets acquired during various rounds of quantitative easing. The challenge, no matter who the Fed Chair is going to be, is the impact any tightening might have on the economy. Bernanke has cautioned many times that rates should not be raised before the recovery is firmly “entrenched.” What he is referring to is that market forces may still warrant further de-leveraging. If the stimulus is removed too early, so Bernanke has argued, the economy might fall back into recession. A more hawkish Fed Chair, such as a Glenn Hubbard, may accept a recession as an acceptable cost to exit monetary largesse; however, because there is so much stimulus in the economy, just a little bit of tightening may well have an amplified effect in slowing down the economy. Keep in mind that European countries are complaining when their cost of borrowing rises to 4%, calling 7% unsustainable. Given that the U.S. budget deficit is higher than that of the Eurozone as a whole, and that our fiscal outlook is rather bleak, it remains to be seen just how much tightening the economy can bear. Our forecast is that with a Republican administration, we are likely to get a rather volatile interest rate environment, as any attempt to tighten may have to be reversed rather quickly. Fasten your seatbelts, as shockwaves may be expressed in the bond market and the “tranquility” investors have fled to by chasing U.S. bonds may well come to an end. Foreigners that have historically been large buyers of U.S. bonds may well reduce their appetite to finance U.S. debt, with potentially negative implications for the U.S. dollar. Let’s dig a little deeper and look at who actually decides on interest rates: it is the voting members of the FOMC that ultimately make the imminent monetary policy decisions, rather than the noise creating pundits and non-voting members. Two previously vacant seats on the Fed's Board of Governors were recently filled by Jeremy Stein and Jerome Powell this May. Like other board governors, both Stein and Powell appear to be in favor of Bernanke's dovish policy. Stein was a Harvard economics professor and used to be more ‘hawkish’ before he took office. But in his first keynote speech as a board governor on Oct. 11, Stein openly supported QE3 and called for continuing asset purchases in absence of a substantial improvement in the labor market. Jerome Powell was a lawyer and private equity investor as well as an undersecretary under George H.W. Bush. Powell has also expressed support for more easing, with inflation an afterthought. Their appointments not only fill all voting seats at the Fed for the first time since 2006, but also further increase the board’s dove-hawk ratio from 9-1 to 11-1. The influence will also carry on to the following years, as board governors hold non-rotating voting rights. Additionally, four current voting members will be replaced next year, including Richmond Fed president Jeffrey Lacker, who has dissented in every FOMC meeting this year. Regional Fed Presidents, unlike Governors, vote on a rotating basis. In 2013, Kansas Fed president Esther George is likely to be the only voting member who appears to hold a hawkish stance. George has expressed her opposition to QE3 and the Fed’s balance sheet expansion, echoing her predecessor Thomas Hoenig's hawkish tone. But given that she is not a Ph.D. economist, her passion and influence is likely to be more on regulatory than monetary issues; we doubt she will be as vocal as Hoenig or Lacker. In our assessment, the FOMC committee may be "über-dovish" in 2013. Finally, Minneapolis Fed President Narayana Kocherlakota, who was known as a monetary policy hawk, has recently shifted to a more dovish stance. He surprised the market with remarks supporting the Fed’s decision to keep rates extraordinarily low until the unemployment rate has fallen below 5.5%, as long as inflation remains below 2.25%. Kocherlakota will be a voting member in 2014, but his shift of stance will weaken the hawkish voice. With fewer dissidents on the board, the Fed may continue to err firmly on the side of inflation and stick to to its mid-2015 low rate pledge. No matter who wins the election, we will see a policy dilemma for the Fed in the coming years: On the one side, should economic data continue to surprise to the upside, it will be increasingly difficult for the Fed to carry on its dovish policies. On the other side, if the Fed were to abandon its current commitment, we foresee rising market volatility. The U.S. economy is likely to face a “monetary policy cliff” in addition to the “fiscal cliff”. With easy money, inflation risks may well continue to rise, possibly imposing higher bond yields (lower bond prices) and a weaker dollar. With tight money, the Fed may induce a bond selloff. Historically, because foreigners are active buyers of U.S. bonds, the dollar has weakened during early and mid-phases of tightening, as the bond bull market turns into a bear market. It’s only during late phases of tightening that the dollar has historically benefited as the bond market turns yet again into a bull market. We encourage investors to review their portfolios to account for the risk that bonds may be selling off, taking the U.S. dollar along with it. Please sign up to our newsletter to be informed as we discuss global dynamics and their impact on gold and currencies. Please also register for our Webinar on Thursday, November 8th, 2012, where we will focus on implications on China and Asian currencies.